King Mohammed VI of Morocco Thursday conveyed a message of condolences and compassion to President Abdelaziz Bouteflika in the wake of the military plane crash which killed 257 people among whom members of the Polisario separatist front. The King expressed his sympathy to the Algerian President, and his sincere feelings of compassion and esteem, praying God to protect Algeria and its brotherly people from every misfortune. 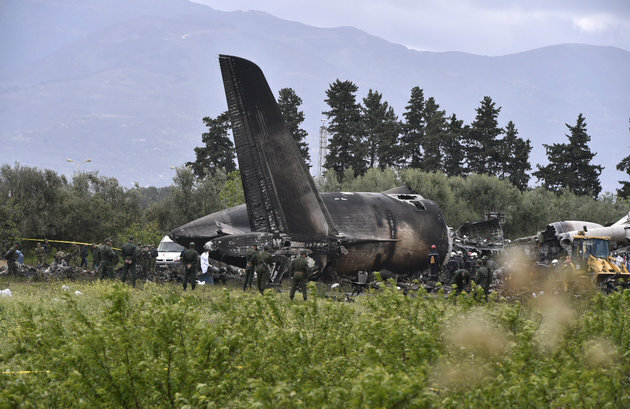 A plane belonging to the Algerian army crashed early Wednesday few moments after taking off from the Boufarek military base, some 30 Km to the south of capital Algiers. All the 257 passengers onboard, mostly Algerian troops, were killed in the crash. The victims included 30 members of the Polisario, a, Algeria-backed separatist movement confronting Morocco over the disputed territory of Western Sahara. Following the crash, President Bouteflika decreed three days of morning while the Polisario declared a seven-day mourning. Posted by Khalid Al Mouahidi on April 13, 2018. Filed under News. You can follow any responses to this entry through the RSS 2.0. Both comments and pings are currently closed.